The below artworks are the most important in The Arts & Crafts Movement - that both overview the major ideas of the movement, and highlight the greatest achievements by each artist in The Arts & Crafts Movement. Don't forget to visit the artist overview pages of the artists that interest you. 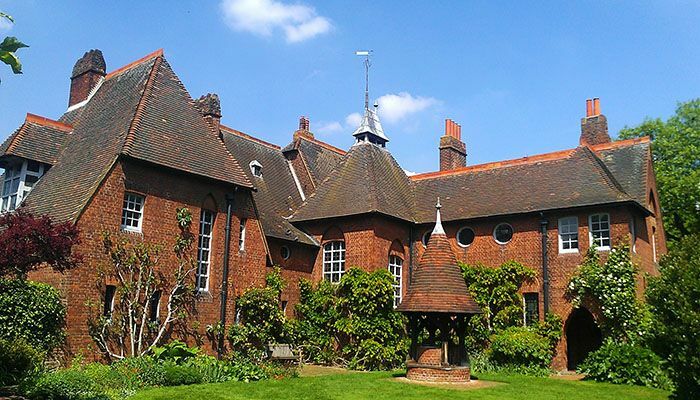 Artwork description & Analysis: Often called the first Arts & Crafts building, Red House was appropriately the residence of William Morris and his family, built within commuting distance of central London but at the time still in the countryside. It was the first house designed by Webb as an independent architect, and the only house that Morris built for himself. Its asymmetrical, L-shaped plan, pointed arches and picturesque set of masses with steep rooflines recall the Gothic style, while its tile roof and brick construction, largely devoid of ornament speak to the simplicity that Morris preached and its function as a mere residence, though the interiors were in places richly decorated with murals by Edward Burne-Jones. The house represented a sharp contrast to suburban or country Victorian residences, most of which were elaborately and pretentiously decorated. Its location allowed Morris to remain in touch with nature, away from London's dirty, polluted core. The design, which included unusually large servants' quarters, spoke to Morris and Webb's budding Socialist inclinations towards erasing class distinctions. Unfortunately, the long hours that Morris spent commuting proved too burdensome for his productivity, and after only five years in the house he sold it and moved his family into London above the shop for his firm. Artwork description & Analysis: The Tulip and Rose curtain exemplifies the kinds of textiles and wallpaper designs produced by Morris' firm beginning in the 1860s. The dense, precisely interlocking pattern of the wool fabric, using curved and exaggerated forms of plants, flora (and sometimes fauna) became a hallmark of Morris & Company's fabric and wallpaper products in the 1870s and '80s. 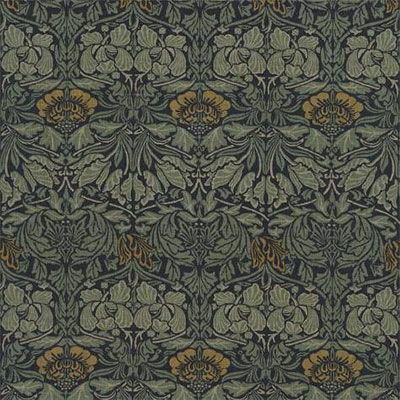 Artwork description & Analysis: The tomes that William Morris produced during the last six years of his life were the epitome of the luxurious pieces manufactured by his firm. They were designed as art objects to be experienced as much as books to be perused, so much so that it is difficult to read them straight through like an ordinary text. The decoration is so lavish and elaborate, overwhelming the printed text to such a degree that one is compelled to stop at every pair of pages and examine it with care before attempting to continue with the narrative (put forth in generally small type). One is immediately struck by the sheer amount of labor involved in creating the plates for printing, the typesetting, the process of making the paper and the binding, along with the cover decoration. 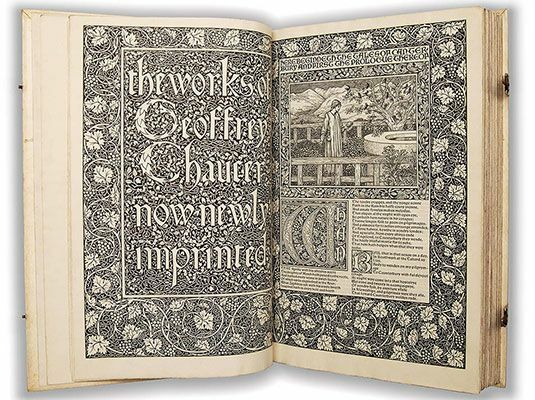 The Chaucer, which was the jewel of Morris' volumes made at the Kelmscott Press in an edition of only 425 copies, resembles the ancient medieval colophons with painted calligraphic script and thick binding. 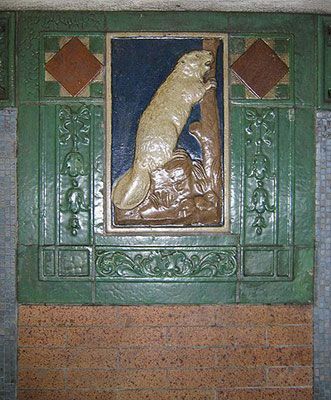 Artwork description & Analysis: The subway tile here represents the way mass production became a hallmark of the Arts & Crafts movement in the United States and ultimately put an end to the large-scale use of handcraft by most design firms. Grueby, founded in 1894 in Revere, Massachusetts, was known primarily for its production of art pottery vases, often using the matte cucumber green glaze that can be seen here as well. But the company was also renowned for its architectural tiles, which it instead produced in molds. In 1904 the company, which had built a name for itself by earning several gold medals at international fairs, was awarded the contract for the pictorial tile revetments in the stations of the new Interborough Rapid Transit lines of the New York Subway. This was not enough, however: Grueby's mass-production competition forced it into bankruptcy in 1909, and after a decade of instability, the company closed for good in 1920. Artwork description & Analysis: If the bungalow is the quintessential Arts & Crafts house, the Gamble House could be described as the perfect "overgrown" example. Designed by the architectural firm of the brothers Greene & Greene, Massachusetts transplants to southern California, for the eponymous executive of Procter & Gamble, the house demonstrates the way that the movement's notions of simplicity and homeliness were transformed into the preserves of the upper classes. 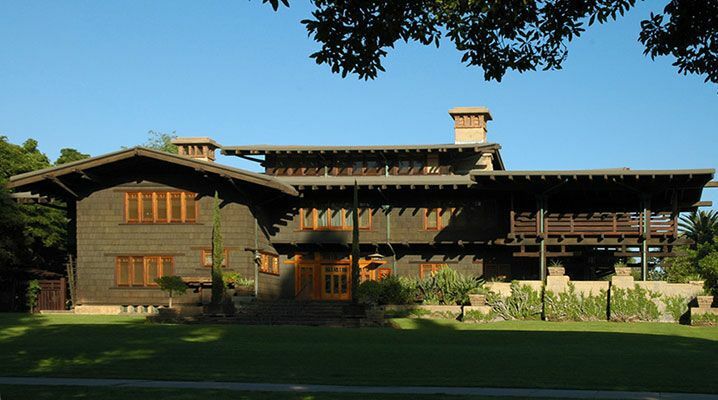 It remains the best example of the Greenes' architectural work and is sometimes described as an exemplar of the Western Stick Style. Artwork description & Analysis: Newcomb College Pottery is emblematic of a well-known regional strain of the Arts & Crafts movement, and the most famous of those located in the American South. It also bears the distinction of being one of the few Arts & Crafts centers that was directly attached to an institution of higher education, the women's college of Tulane University. This vase, painted by Sarah ("Sadie") Irvine, the best-known of the Newcomb Pottery designers, shows the most popular theme for the vessels they produced: the "Moonlight and Magnolias" imagery of broad-canopy live oak or magnolia trees, adorned with moss drooping from their branches, silhouetted against a night sky with a full moon. The most naturalistic and least stylized of the various Newcomb Pottery designs, this imagery clearly roots the piece in the region of the lower Mississippi River valley, where magnolias are abundant, as if to advertise directly its origin. 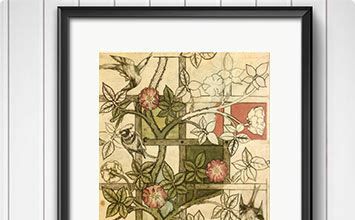 Artwork description & Analysis: Voysey's sideboard illustrates well many of the tenets of Arts & Crafts furniture. The straightforward design appears so homely that one might almost mistake it for a piece of folk art. 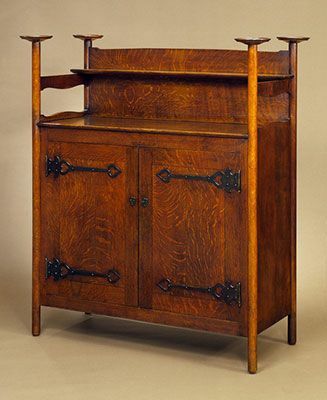 The sideboard rests on four posts that appear almost to be too thin to carry its mass; they are extremely plain, as not even the feet include fittings, and terminate in shallow circular platforms that may have been intended to hold candles, underscoring the anti-modern tenor of the environment this piece was meant to occupy. The wood, fittingly, is oak, a very common selection for Arts & Crafts furniture, which has been hewn in order to expose the grain, and stained to visually emphasize the material's texture. The organization of the sideboard's storage is honest and simplistic: a cabinet containing possibly a shelf, a counter, and a shelf above attached to the back. Virtually nothing about the piece is hidden or complicated.